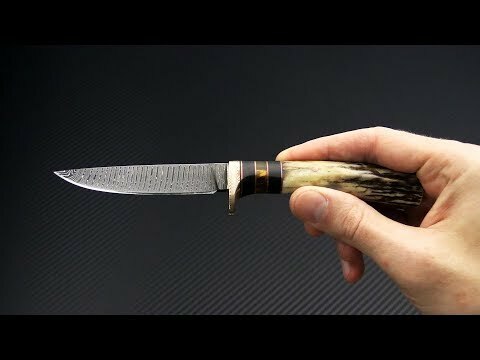 The Burr Oak Custom Neck knife is a uniquely finished full custom fixed blade knife handmade by Mark Nevling. This compact neck knife has Bird & Trout DNA and is made from a Tight Twist pattern carbon steel Damascus blade with Stag handles, copper, ebony and amber spacers and Mokume guard. Blade: Taking inspiration from the Bird & Trout knife form this custom neck knife has a long, slim blade that is nimble and capable. The blade is a carbon Damascus with a Tight Twist pattern that is eye-catching with a full flat grind for excellent performance. The carbon Damascus is tough and takes a razor sharp edge for easy maintenance in the field. Handle: The hidden tang of the blade is attached via a single pin to the rustic Stag handle that tapers to the pommel for a solid, secure grip. Thick Ebony and Amber spacers with thin copper spacers offer a classic look. Making this piece even more striking is the Mokume finger guard which is generous for both the visual for and function. The neutral handle design in comfortable in nearly any grip. Sheath: Carries via hand stitched leather neck sheath with Rattle Snake inlay.